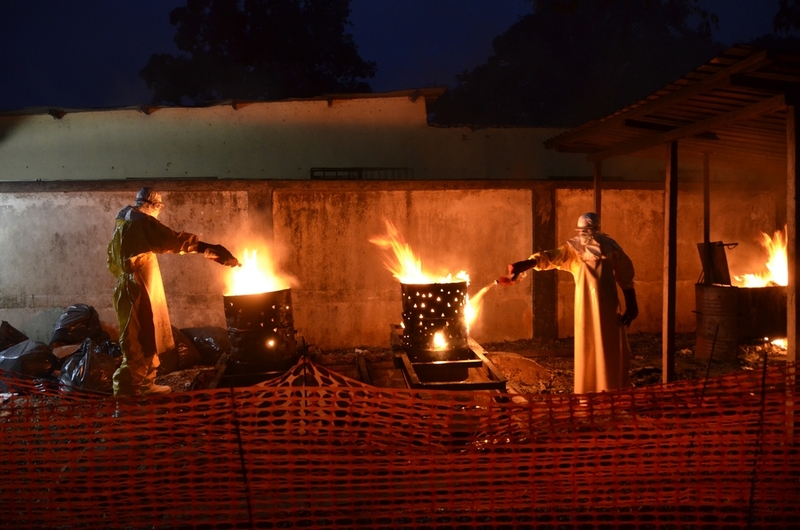 Conakry, the first major city to be affected by the Ebola outbreak in West Africa, is currently seeing a massive spike in cases. In July, case numbers appeared to decrease in Guinea, suggesting the end of the outbreak might be near. But Médecins Sans Frontières/Doctors Without Borders (MSF) is now caring for more than 120 patients, of whom 85 are confirmed to have the virus, in its two case management facilities in the country, Conakry and Guéckédou. The Donka Ebola management centre, situated inside the Ministry of Health hospital complex in Conakry, has been particularly badly affected. The facility admitted 22 patients in one day, on the 6th October, 18 of them coming from Coyah region which is 50 kilometres east of Conakry. There are now 62 patients in the Donka centre, which has 60 beds and is currently being expanded with 14 more. This would appear to confirm fears of a massive hike in cases in the capital. The Donka centre has been able to respond to previous peaks by adapting its capacities. But with the arrival of so many new patients, including a number of children who require a high level of attention, the centre is now stretched to the limit of physical space where it is located. Stephane Hauser, MSF Field Coordinator in Donka, has noted a consistent increase in cases since his arrival at the end of August. At the moment more than 130 people are working around the clock at the Donka treatment centre, most of whom have high levels of expertise. Out of the 220 confirmed cases admitted since the centre opened, 105 have recovered. Today however, the medical and sanitation teams, fatigued by several months of hard work, must be reinforced in order to guarantee the quality of care. “Our teams are showing incredible dedication. Faced constantly with death, sometimes even those of their own colleagues, and working in difficult conditions, not one person has quit,” says Hauser. To relieve some of the pressure on its teams, MSF is actively training others who can step in. The teams have carried out training sessions for healthcare workers with the Ministry of Health and the water and sanitation personnel of local organisations like the Guinean Red Cross, who are expected to start working in other health facilities. But faced with the high number of patients currently needing care, these people will remain part of the team at the Donka facility for now. “I am really concerned that one day I will be forced to make the decision to turn patients away because of a lack of space,” concludes Hauser.